I have a driver’s license for motorbikes as long as I own a driver’s license for cars. But since the day of my driving test I did not ride a bike since I never owned one. 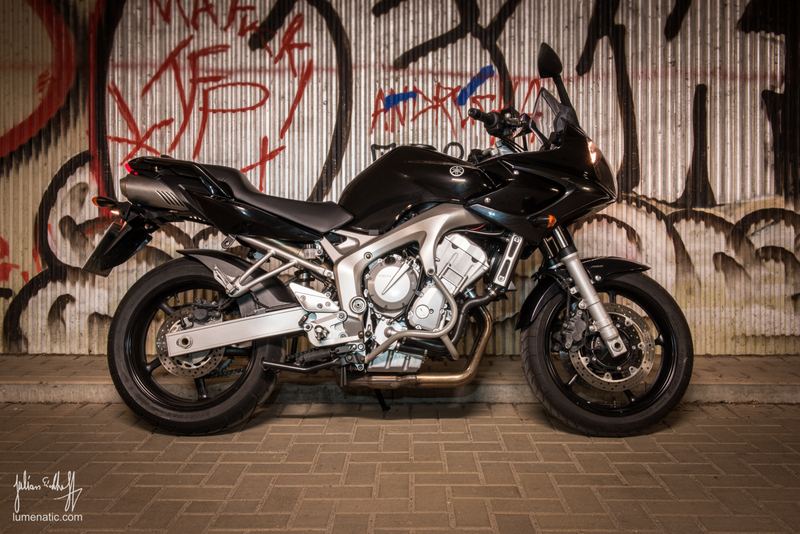 When I was younger I did not have the money, during my studies I had other things to focus on and over time the wish for a motorbike went dormant. But it was always there, slumbering in the back of my mind. It was time. The desire awoke and powerfully forced its way out. 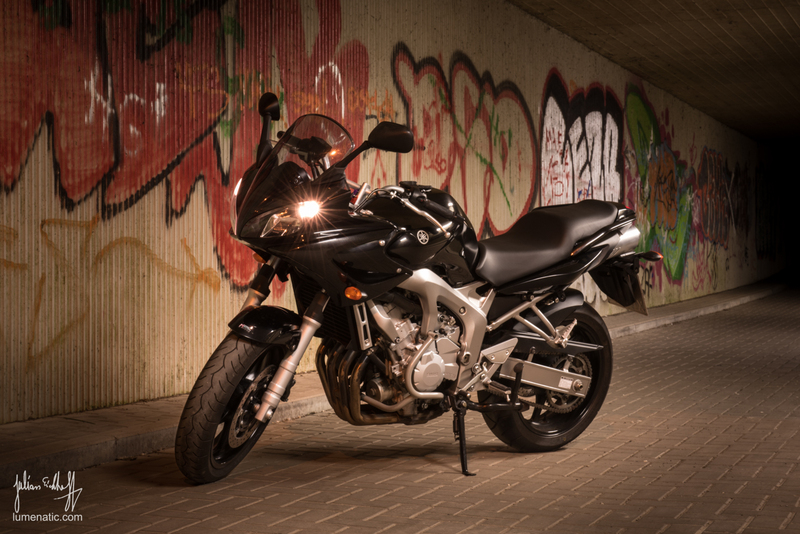 On a Friday I decided to buy a motorbike, and a few days later I was fully clothed and geared and called myself the owner of a second hand Yamaha FZ6 Fazer. And with this “newly found” hobby, what would lie closer than combining it with my other hobby – photography ? That’s why this and the next post is about motorbike photography. I will feature four different bikes, one being my own and three others from friends and colleagues. 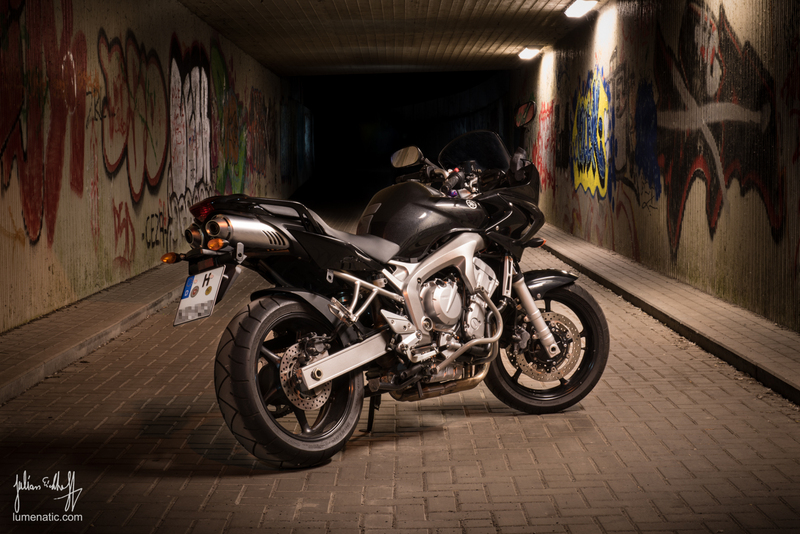 In this post I will present a Yamaha FZ6 Fazer and a Kawasaki Z750 Streetfighter (and one image of a bike I made in 2011, presented as a case study). Basic thoughts on bike photography. Keep in mind what I am showing in this and the next post is just one of many possible “recipes” for creating good motorbike images. I am not claiming that this is the only valid way. Disclaimer end. Perspective / positioning the bike. 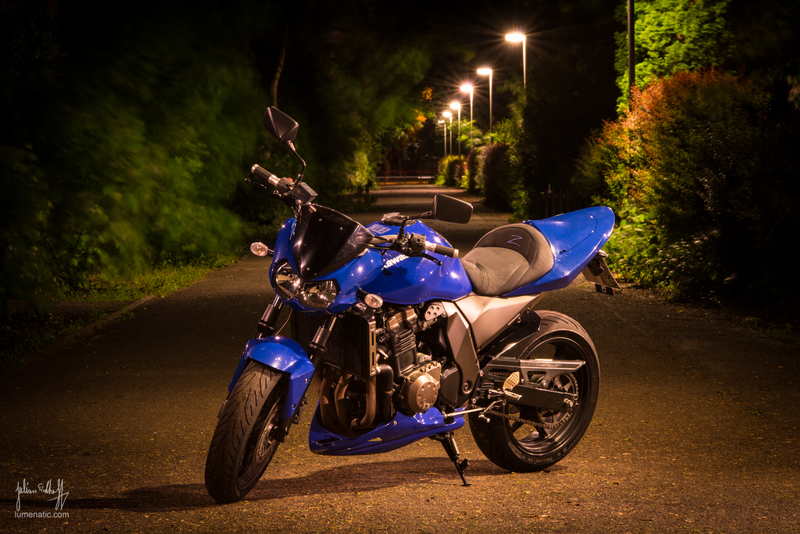 The bike is supposed to be the main subject of the image. Choose an environment which fits the bike and that is not too distracting. Examples include wide open fields, long roads, empty parking spaces, industrial areas or, in the unlikely event you happen to have access to one, a hangar or an airport runway. The images I am showing you today were shot in two different locations (three if you count the single image from the case study below). One is a pedestrian walkway (= no parking cars that disturb the image) and the other one is an underpass beneath a railway track. Both locations have their own appeal. All images were shot when it was dark outside, so the street lamps illuminated the scenery. Strobes were used to lightpaint the rest. 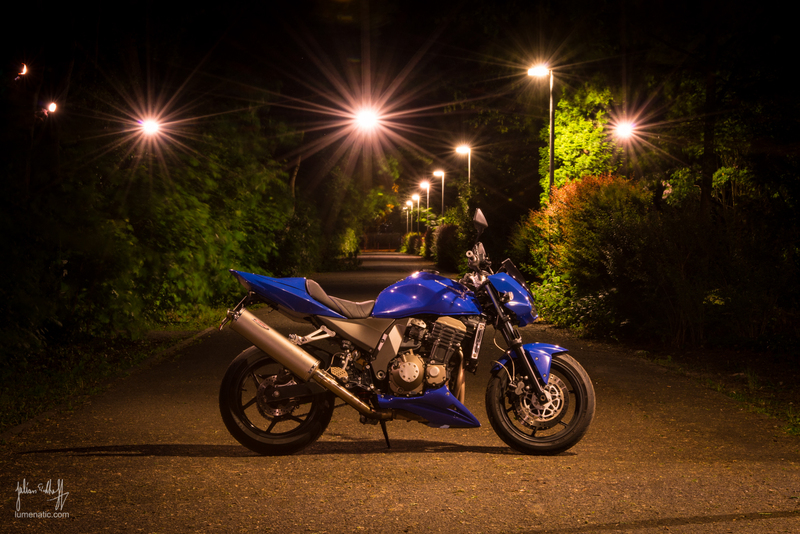 Keep in mind to use filters to match the light of the strobe the light of the street lamps. Flourescent light demands a green filter on your flash, incandascent light sources require an orange filter. But also working with available light can produce stunning results. If the parameters match, using a flash is not necessary. Refer to the case study below to see what I mean. I found it appealing to photograph the bikes at “eye-level” or a tad above (but not too much). 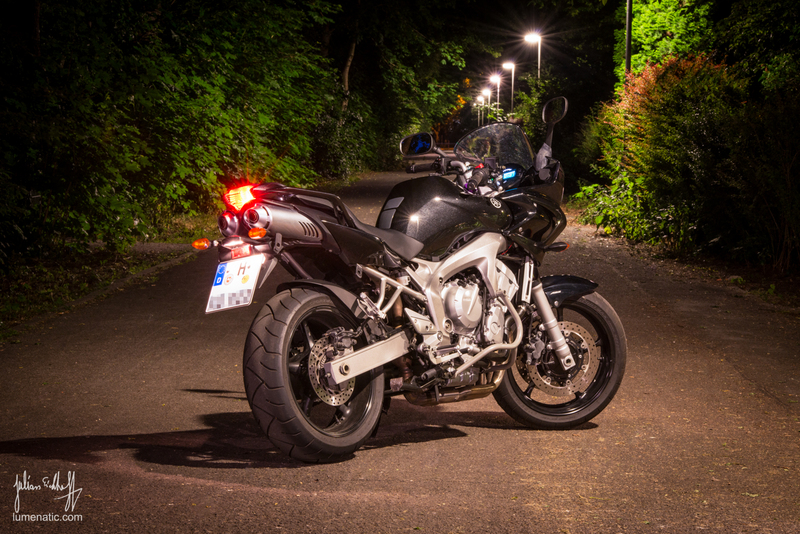 During my photo sessions the camera was mounted on a tripod at roughly the level of the bike’s tank. 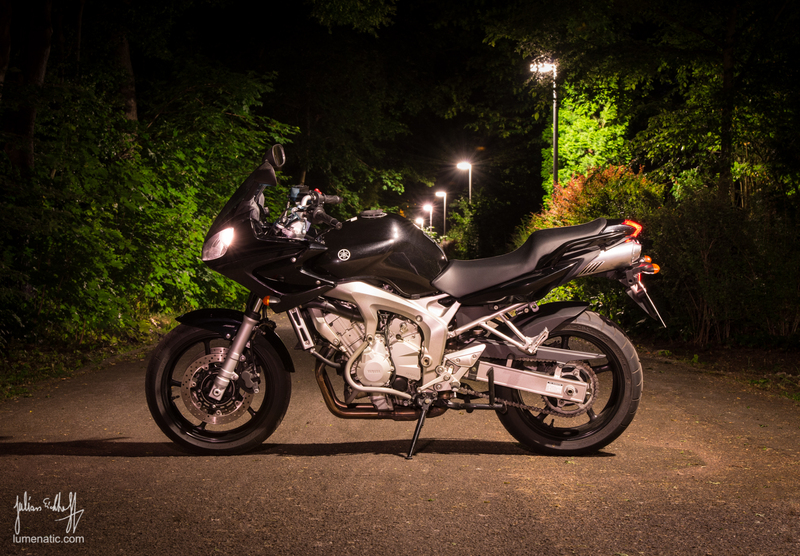 I positioned the bikes in such a way that the street lamps illuminated them. 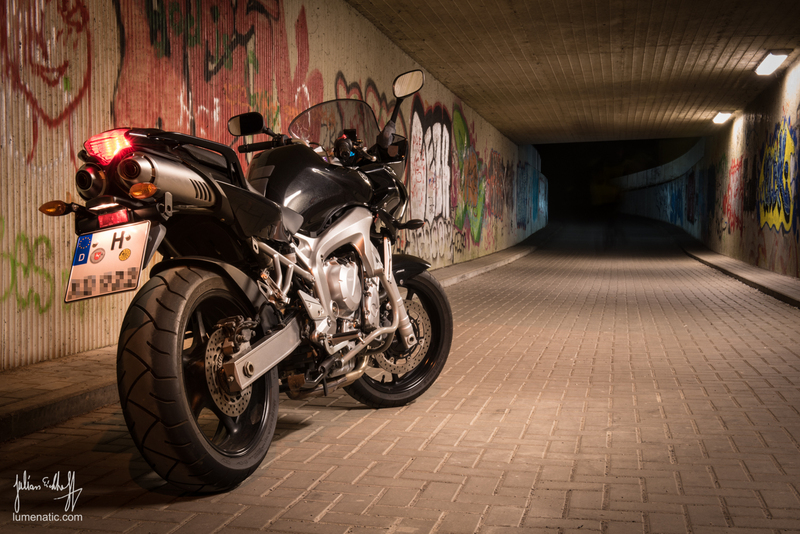 There are basically two standard ways to position the bike relatively to the camera: side view (bike at 90° to the camera) or a diagonal positioning (bike at 30-45° to the camera, either the front or the back facing the camera). A full frontal shot (bike axis in line with the camera) was not to my liking, as the bike’s charakter did not come through in these images. Again – my taste, must not match yours. Pay attention to the position of the handlebar. Tilting the handlebar to the left or right can make the shot more interesting. To illustrate how these three elements play together let me show you an image I made in 2011. The image was taken on the fly. 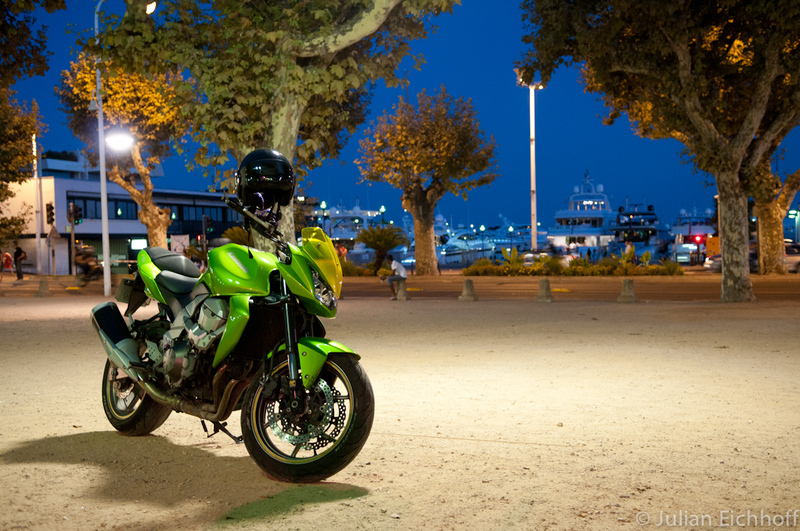 The bike was parked at the yacht harbour in Nice, France. We were on the way to a restaurant when this scene caught my eyes. It was magic hour, the street lamps illuminated the empty parking space. No people near the bike. Pause – click – that was it. I especially like the colours in the image. If we dissect this shot all three elements mentioned above can be found. The location is great. The bike is alone on a empty space, the elements in the background make the scene more vivid and interesting, but don’t distract the viewer. The bike is the main subject of the image. Lighting could not be any better. Magic hour – blue sky, the green of the bike stands out very nicely. Perspective – also here the owner of the bike (whose acquaintance I did not make by the way) parked the bike at an angle of about 30° against the road in the background. The handlebar of the bike is slightly tilted, which makes the shot more interesting. Again – the shot was not planned and a lucky superposition of all three mentioned elements led to the nice outcome. Back to the recent shootings. The shooting procedure in detail. The camera was mounted on a tripod at roughly the level of the bike’s tank or a little above that (see previous paragraph). I took long exposures (up to 30s) and brutally closed the aperture (most images @f/22). I activated exposure delay mode (1 sec) to eliminate vibration from pressing the shutter. Once the exposure started I used the (handheld) flash (in manual mode) to lightpaint the bike. Flash power was determined by trial and error. I am not afraid to confess that I use chimping as a method to achieve a good exposure. Pay attention to the direct surroundings of the bike. Remove leaves, sticks, stones or debris. Pro tip: bring an old rag to the shoot and, after positioning the bike, wipe the tires with it. 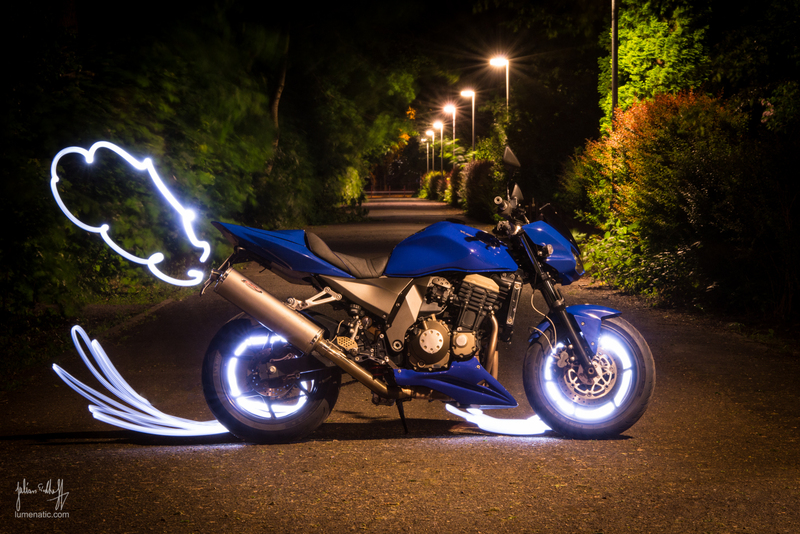 Play with the lights of the bike. Make an image with the lights off, one with the lights on to see what looks more interesting in your eyes. Post processing in Lightroom involved the repair stamp tool to remove unwanted objects from the foreground (any leaves, stones, sticks, cigarette butts I missed earlier). 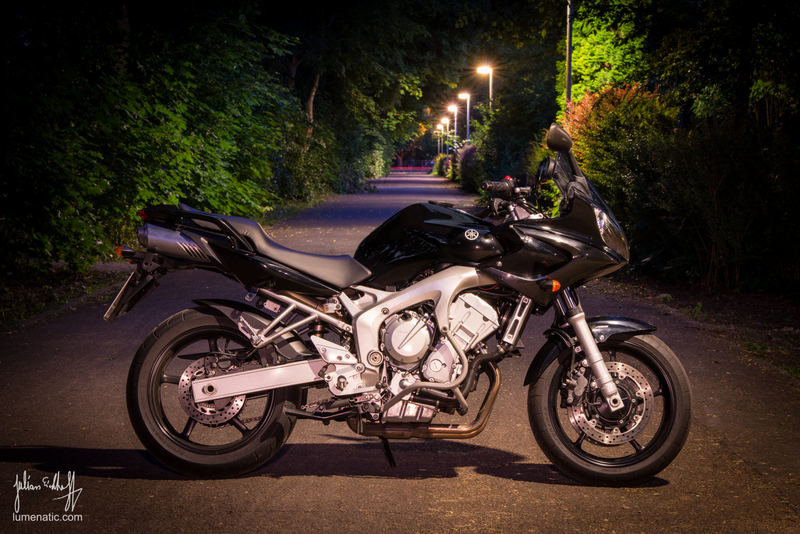 Gradient filters, vignetting and the brush tool were employed to direct the focus on the bike. I darkened the corners and borders of the images and, if necessary, used the brush tool to brighten the details on the bike a little. Photoshop was used only to scramble the numberplate. 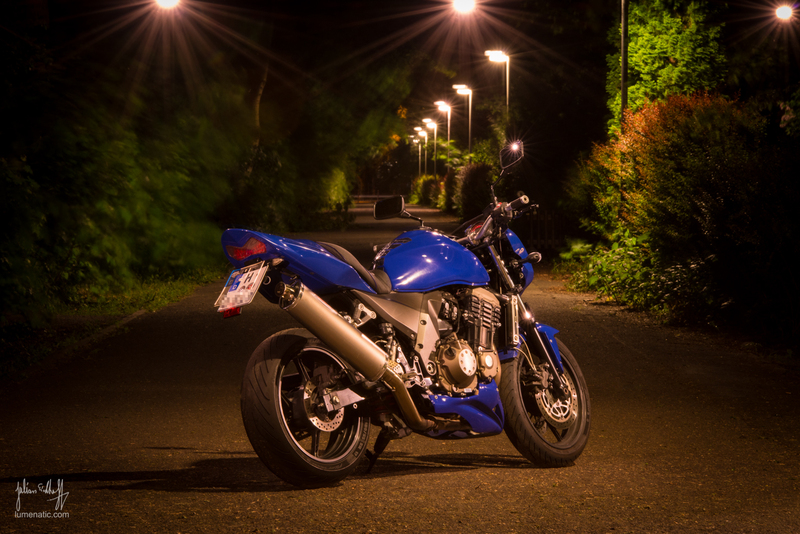 The blurred background in the images with the blue Kawasaki is a natural effect of a long exposure – it was a windy evening and the leaves were in constant motion. Note the three extra light sources in the following two images. That was achieved by simply walking behind the bike during the exposure und fire the flash in direction of the camera. I am not in the image because I wore a black jacket and did not reflect enough light back to camera to leave an impression on the sensor. Remember – 30s exposure ! The shapes were drawn during the 30 sec exposure duration. I pressed the shutter button, fired three bursts with the flash to illuminate the bike and then ran behind the bike. At first I painted the exhaust fume cloud (flashlight on – paint cloud – flashlight off). Then I moved down and painted the “fly-away”-lightstrips behind the rear tire. Flashlight on, painting, flashlight off. When lightpainting remember to switch the lightsource off when moving it from one element to the next, otherwise that movement will leave a lightstrip, too. By the way, the header image of this post was created using the same technique. It was especially tricky, as “lumenatic.com” contains many letters. The flashlight had to be switched on and off in sync with the painting and the letter spacing had to be roughly equal. Took me ten takes (which included three “keepers”). 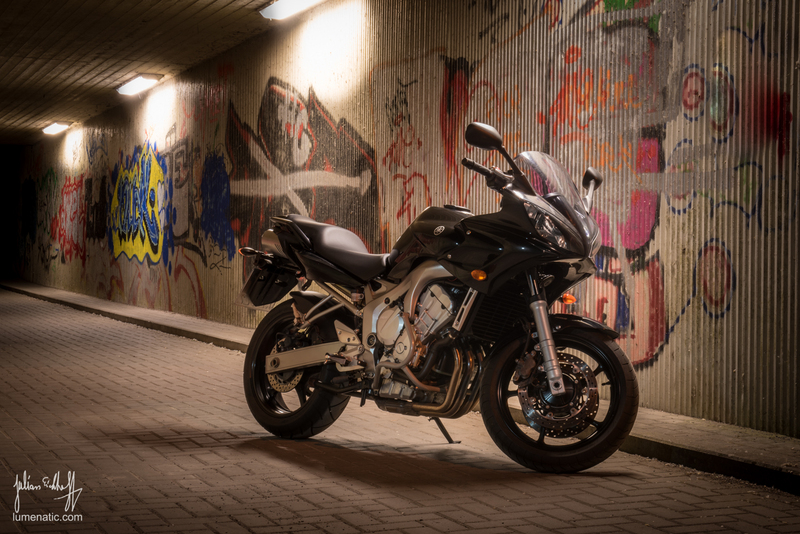 The following images of the Yamaha were shot in an underpass. It is a more sterile, restricted evironment than the open walkway with its trees and bushes. I applied the same rules (location-lighting-positioning). The bike stood in the light cone of the ceiling-mounted flourescent lamps. I used a flash (with a green filter) to brighten the bike even more. To be honest – the impact of the flash was quite modest as the bike is black. I made comparison shots, one without flash one with. The difference was minute (due to the small aperture). In the following image I used the flash mainly to illuminate the exit of the underpass, so that the viewer is not guided towards a “black hole”. Stay tuned for the next post, in which I will present a Moto Morini Granpasso 1200 and a Ducati 748 S Biposto.